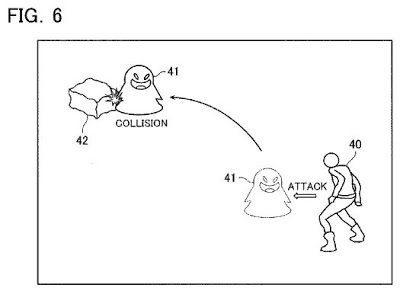 The ‘976 patent describes a type of role-playing game where the user’s character has different attacks available that do different damages and have different effects (think Final Fantasy). The invention determines whether an attack is direct of a specific kind of attack. The invention also provides for a panic reaction where the player’s character’s attacks change depending on the level of panic the character is experiencing. If the panic is too high the user can neither attack nor defend against the enemy character. The player may also check the level of panic in the opposing character and strategically plan an attack against the enemy, creating more damage than a normal attack. When a player character applies a damage to an attack target character on the basis of an attack action of the player character, it is determined whether the attack is a direct attack or a specific kind of attack different from the direct attack and defined in advance. A panic reaction term of a panic reaction is determined in the case where it is determined that the attack is the specific kind of attack. In the panic reaction, the attack target character becomes a state where the attack target character cannot attack the player character and defend oneself from an attack from the player character. The panic reaction is executed until the panic reaction term elapses. A privilege is applied to the player character in the case where it is determined that the attack target character suffers the direct attack during execution of the panic reaction. 1. A video game processing apparatus that causes an image display apparatus to display a player character on an image display screen of the image display apparatus, the video game processing apparatus controlling progress of a video game by controlling an action of the player character to be displayed on the image display screen in accordance with operations by a player, the video game processing apparatus comprising: an attack specification receiver that receives an attack specification for the player character by an attack specification operation of the player; an attack determiner that, when the player character applies a damage to an attack target character on the basis of an attack action of the player character in accordance with the attack specification received by the attack specification receiver, determines whether the attack action suffered by the attack target character is one of a direct attack and a specific kind of attack, in the direct attack the attack target character suffering a damage directly from the player character, the specific kind of attack being different from the direct attack and defined in advance; a reaction term determiner that determines a panic reaction term of a panic reaction when the attack determiner determines that the attack action is the specific kind of attack, the panic reaction being a specific kind of attack suffered reaction indicating a reaction of the attack target character that suffers the specific kind of attack, in the panic reaction the attack target character being in a state where the attack target character cannot attack the player character and defend oneself from an attack from the player character; a reaction executor that executes the panic reaction for the attack target character that suffers the specific kind of attack until the panic reaction term determined by the reaction term determiner elapses; and a privilege applier that applies a privilege to the player character when the attack determiner determines that the attack target character suffers the direct attack during execution of the panic reaction by the reaction executor, wherein the reaction term determiner determines a new panic reaction term by extending a remaining term of a previous panic reaction term when the attack determiner determines that an additional attack that the attack target character suffers during execution of the previous panic reaction is the specific kind of attack, wherein, when the new panic reaction term determined by the reaction term determiner exceeds a predetermined threshold value during the execution of the previous panic reaction, the reaction executor terminates the execution of the panic reaction for the attack target character and causes the image display apparatus to display a status indicating that the new panic reaction term exceeds the predetermined threshold value in the vicinity of a display position of the attack target character on the image display screen, and executes a first specific reaction, in which the attack target character is in a state where the attack target player can attack the player character and defend oneself from the player character, until the new panic reaction term elapses, and wherein the privilege applier applies the privilege according to the displayed status of the attack target character to the player character when the attack target character suffers the direct attack from the player character to become a battle impossible state during execution of the first specific reaction.